In the year 2030, a brilliant robotics engineer named Dr. Boynton loses his son Toby in a tragic car accident. Distraught over his death, the dedicated, but heart-broken scientist uses his technical experise to construct an android in the boy's image. 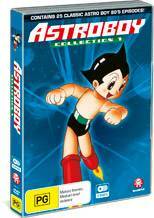 But all was not as he'd hoped, for the scientist soon realised the robot, Astro Boy, could never grow into a human capable of filling the void in his heart. Astro Boy Tissue Cover CERTAIN MAGICAL INDEX III NENDOROID PLUS KEYCHAIN ASST.